Featured amenities include a business center, a 24-hour front desk, and multilingual staff. Planning an event in Viseu? This pousada has facilities measuring 16570 square feet (1539 square meters), including conference space. Free self parking is available onsite. The Hotel Ruby has a modern and warm atmosphere, enhanced by the quality of their services, ideal for a relaxing leisure or business stay. Take in the views from a terrace and make use of amenities such as wireless Internet access (surcharge) and a fireplace in the lobby. Situated just 2 km from the historical centre of Viseu, this eco hotel is a 5-minute drive from the Grão Vasco Museum. It is also less than 2 km from the Teatro Viriato and several traditional taverns. All the rooms are bright and feature balconies, parquet floors and come equipped with air conditioning and cable TV. In the morning, guests can enjoy a buffet breakfast. The hotel also has a bar that offers cocktails and a restaurant with a sun terrace that serves international cuisine and regional wine. There is complimentary WiFi access available in public areas for guests who want to stay connected. Those who are driving can make use of the on-site car park. Holiday complex was built in 1750. Holiday complex was completely renovated in 2011. The property consists of 12 luxury rooms. The property is made up of 3 single rooms, 4 double rooms, 2 junior suites and 2 suites. This attractive hotel provides the ideal base for both sightseeing and business. Situated in the city centre, the Holiday complex is convenient to the rest of the city. Guests will find numerous bus and metro stops within walking distance. The Holiday complex provides air-conditioning in all areas. The Holiday complex provides a lift. There is a shop on the premises. There is mobile phone coverage throughout the Holiday complex. The Holiday complex offers a laundry service. The establishment is wheelchair-accessible. Guests can make use of the Holiday complex 's bicycle storage area. Surrounded by beautiful parkland, this pleasing hotel is located at the heart of Viseu. Various shopping facilities, bars and restaurants can be found within 200 m of the hotel and the nearest nightclub is about 5 km away. The hotel comprises a total of 106 rooms as well as 3 suites spread over 3 floors. There is a foyer with a 24-hour reception desk and safes awaiting guests. The air-conditioned buildings include lifts, a TV room, a public Internet terminal and a number of conference rooms. Dining and drinking options include a café, a bar and an à la carte restaurant. There are also room and laundry services on offer. Those arriving by car may take advantage of the car park or garage facilities. The pleasing rooms come with a bathroom with hairdryer. Additionally, a direct dial telephone, a balcony, satellite/ cable TV, an Internet connection, carpeting, a king-size bed, central heating and a hire safe are also included as standard in the air-conditioned rooms. There is a swimming pool in the well-maintained outdoor complex as well as a sun terrace with sun loungers and parasols laid out ready for use. The hotel offers the opportunity to play tennis and the nearest golf course is some 15 km away. Guests may select their breakfast from a buffet. Lunch and dinner may be selected from the à la carte menu. An impressive ultra modern glass and conrete half moon shaped build- ing with front gardens, fountains and car parking area. Located in Viseu, Quinta do Medronheiro Hotel Rural is in the mountains, within a 15-minute drive of Viseu City Hall and Jardim das Mães. 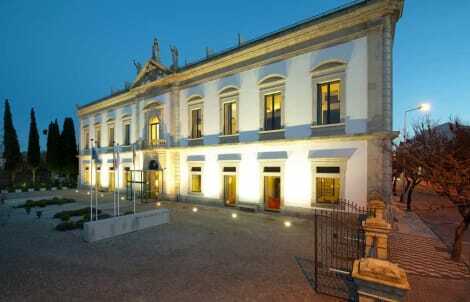 This 4-star hotel is 5.4 mi (8.7 km) from Museu Grao Vasco and 5.4 mi (8.8 km) from Viseu Cathedral (Se Viseu). Make yourself at home in one of the 38 air-conditioned rooms featuring minibars and flat-screen televisions. Wireless Internet access (surcharge) keeps you connected, and cable programming is available for your entertainment. Bathrooms have shower/tub combinations and hair dryers. Conveniences include phones and safes, and housekeeping is provided daily. Make yourself comfortable in your individually furnished apartment. Complimentary wireless Internet access is available to keep you connected. The bathroom has a shower. lastminute.com has a fantastic range of hotels in Viseu, with everything from cheap hotels to luxurious five star accommodation available. We like to live up to our last minute name so remember you can book any one of our excellent Viseu hotels up until midnight and stay the same night.